The infographic, The Guide to SaaS Inventory Optimization, will walk you though the steps to successfully on board an inventory optimization software for your operations. When it comes to inventory management, many organizations struggle to keep costs under control. Seasonality of products, supplier inconsistencies and sales demand variables all weigh heavy on an organizations profits. That is where inventory optimization can help. Inventory Optimization is the science of strategically driving inventory costs down to their absolute minimum level while still achieving high target service levels and fill rates. The cost of not optimizing inventory planning is significant. Most wholesale distributors can lower inventory costs by 30% while also increasing customer service levels by a similar percentage after implementing Software-as-a-Service inventory optimization solutions to support their Enterprise Resource Planning (ERP) Tools. 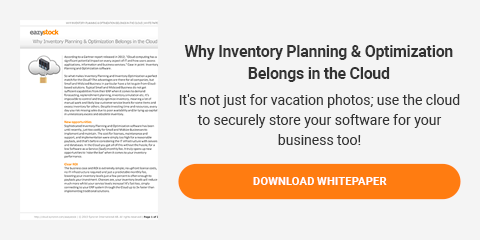 Learn more about SaaS and cloud-based software in our free white paper “Why Inventory Planning & Optimization Belong in the Cloud”; find out about the latest trends in cloud-based software and see how using the cloud to securely store your software can positively impact your bottom line!